Razer Synapse, the official Razer configuration utility, doesn't work on Linux however, there's a tool called Razercfg that allows configuring some of the Razer mice settings under Linux. The application only includes options that are supported by the mouse hardware, like changing the DPI, scan frequency (polling rate) and led colors. So for instance if the hardware doesn't support button remapping, Razercfg won't offer this option. That also means that Razercfg doesn't support macros. 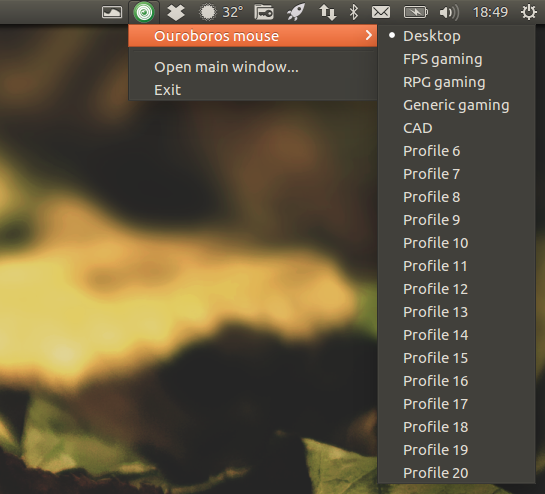 Razercfg also allows saving and easily switching between profiles (Desktop, FPS gaming, RPG gaming, etc.). 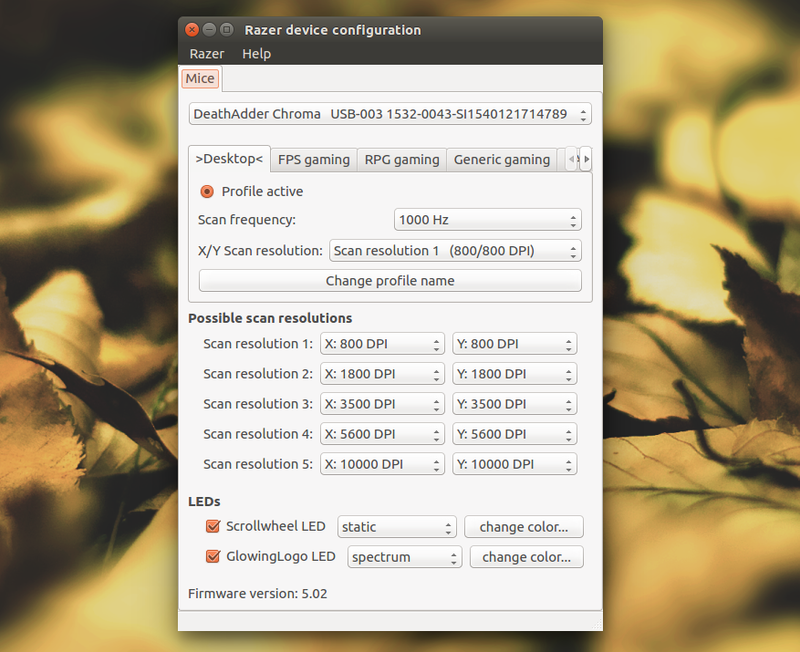 For a complete list of hardware features for each mouse, see the Razercfg homepage. I also managed to add basic support for Razer Ouroboros mice (for both wired and wireless modes), based on this bug report, by using the Taipan code as a base (only basic features: enable/disable the led and change the DPI and scan frequency). This is available if you use the packages available in the main WebUpd8 PPA or by downloading the Debian packaging (you'll find the patch in the debian/patch folder). Don't report bugs related to the Ouroboros on the Razercfg GitHub page since the app doesn't officially support it yet. Note that I only tested the packages in Ubuntu 16.04, which uses systemd, so I'm not sure if it will work in Ubuntu 14.04. Adding the PPA is not required (but you won't receive any updates) - you can download the debs from HERE. If the application doesn't detect your mouse (and the device is listed as supported), try restarting the system and also see the first note below. if the settings are not saved between system restarts, you can edit the /etc/razer.conf configuration file to specify various options and initial hardware configuration settings. For other Linux distributions, see the Razercfg GitHub page. Also see: How To Change The Mouse Scroll Wheel Speed In Linux Using imwheel.